U.S. 18 travels from Interstate 25 and U.S. 26-87 at Orin Junction east to Interstate 794 in Milwaukee, Wisconsin. 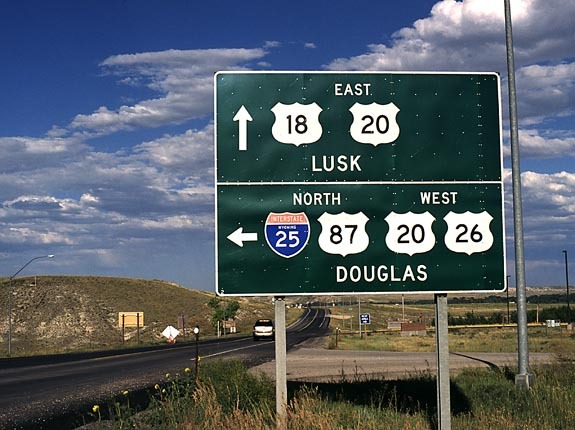 U.S. 18 follows State Control Route 40 from Interstate 25, U.S. 26, and U.S. 87 (Orin Junction) to U.S. 85 (Lusk), State Control Route 25 from Lusk to Mule Creek Junction, and State Control Route 45 from Mule Creek Junction to South Dakota. U.S. 18 traverses such megaopolises such as Manville, Lusk, Hot Springs, Pine Ridge, Winner, Canton, Spencer, Clear Lake, Mason City, and Prairie du Chien on its way to Madison and Milwaukee. Bypass U.S. 18 in Manville was decommissioned in 1982, as the bypass is now mainline U.S. 18-20. The old U.S. 18-20 into Manville is now Wyoming 274. U.S. 18 does not have any state auxiliary routes. U.S. 18 is one of the original 1926 U.S. routes. 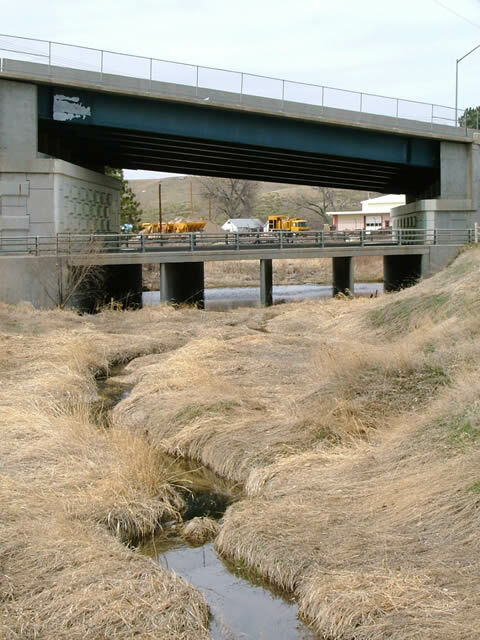 It began at U.S. 85 in the original Mule Creek Junction, just about a mile west of the South Dakota state line. 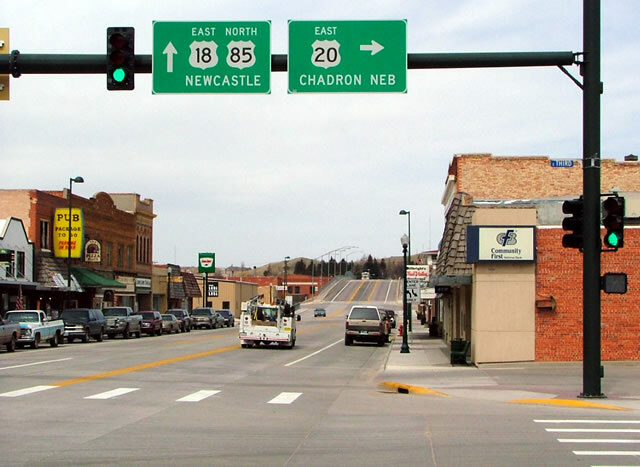 In 1938, U.S. 18 was paired with the then-new Alternate U.S. 85, which was commissioned to provide an alternate route for U.S. 85 travelers into the Black Hills. U.S. 85A today is known as U.S. 385. 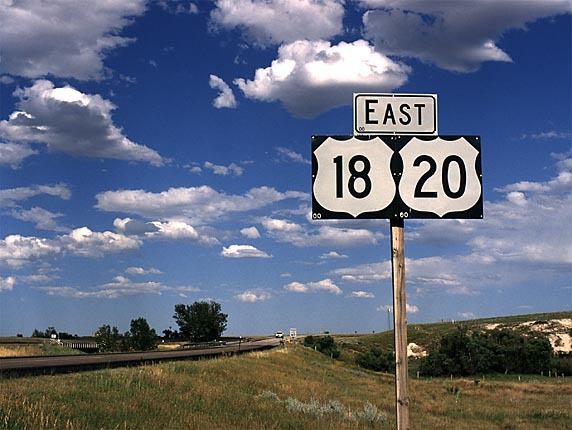 In 1968, U.S. 18 was extended along U.S. 85 and U.S. 20 to reach Interstate 25 in Orin. The first (or last) 88 miles of U.S. 18 are, therefore, duplicated with another route. 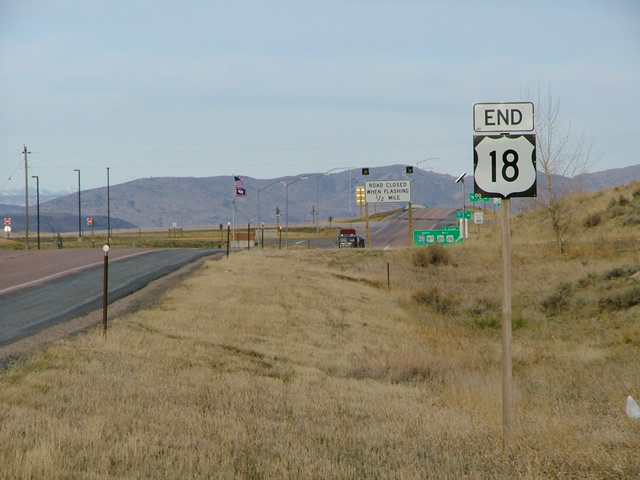 U.S. 18 begins at the Interstate 25 interchange at Orin, and is multiplexed with U.S. 20 and U.S. 85. 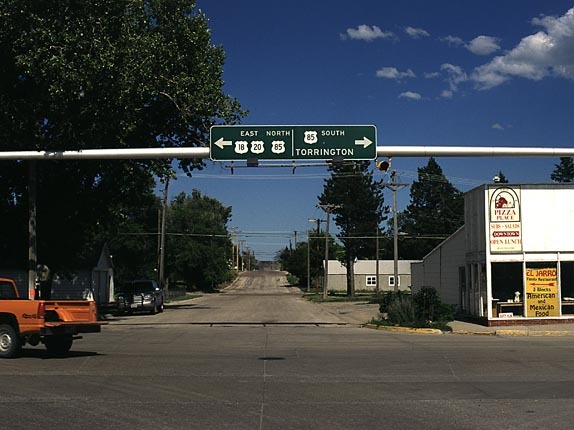 Please check out the guides to these two roads for information on most of the U.S. 18 journey through Wyoming. At New Mule Creek Junction, U.S. 18 turns east to enter the Black Hills of South Dakota. Before leaving Wyoming, travelers pass by the original Mule Creek Junction. This cross road signifies the original alignment of U.S. 85 before it was relocated a mile west. It is now locally maintained. Westbound U.S. 18 ends signage along Westbound U.S. 18-20 approaching Interstate 25 and U.S. 26-87 at Orin Junction. The freeway is just ahead, beyond the rise in the road. Photos taken by Dale Sanderson, 08/98 and 04/04. 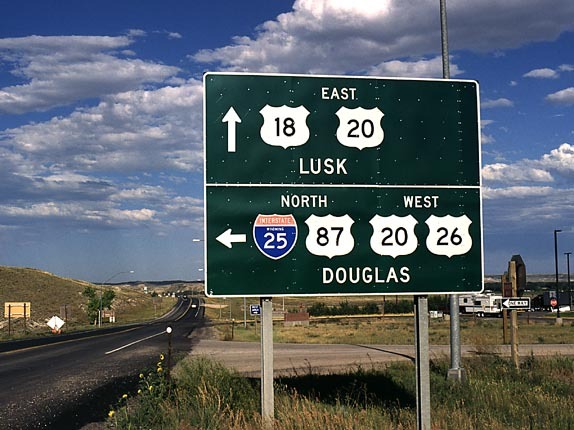 Signage for north Interstate 25/U.S. 87 and west U.S. 20-26 as seen from westbound U.S. 18-20 after the preceding ends signage at Orin Junction. Photo taken by Dale Sanderson, 04/04. 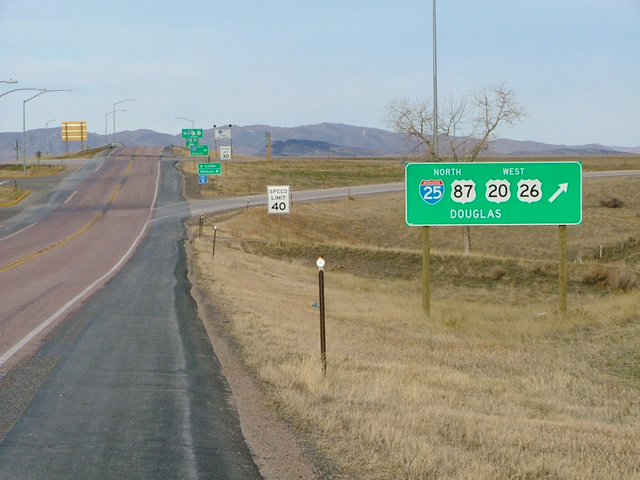 U.S. 18 begins in Orin Junction at the interchange with Interstate 25 and U.S. 20-26-87. 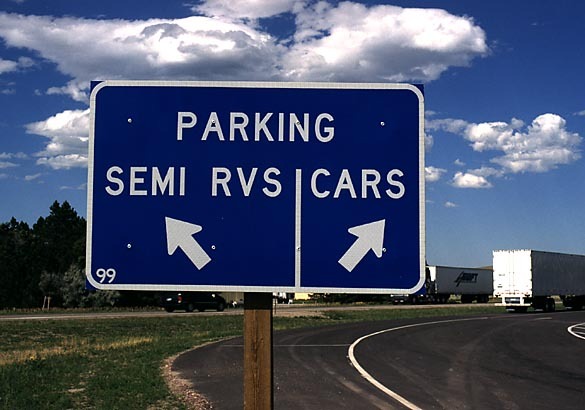 These signs are present along eastbound at the Interstate 25 junction. Photos taken by Jonathan Winkler, 08/00. This is the first shield assembly for U.S. 18-20 eastbound as the paired route travels east parallel to the railroad en route to Shawnee, Lost Springs, Keeline, and Manville. Photo taken 08/31/04. 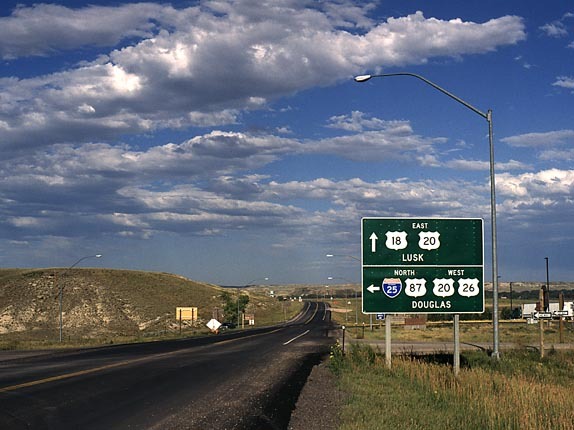 Eastbound U.S. 18 and U.S. 20 approach their junction with Wyoming 319 southbound near Orin Junction. 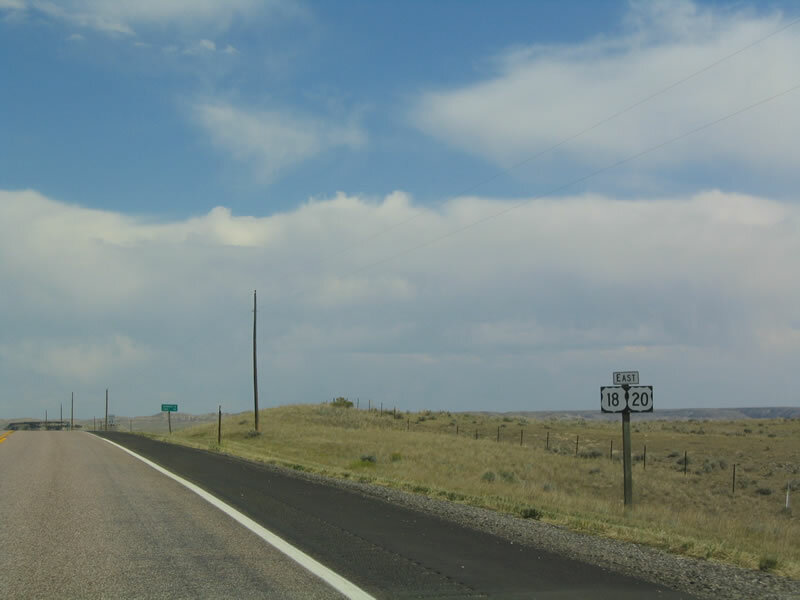 Wyoming 319 is former U.S. 26-87 before the freeway was constructed. Photo taken by Jonathan Winkler, 08/00. 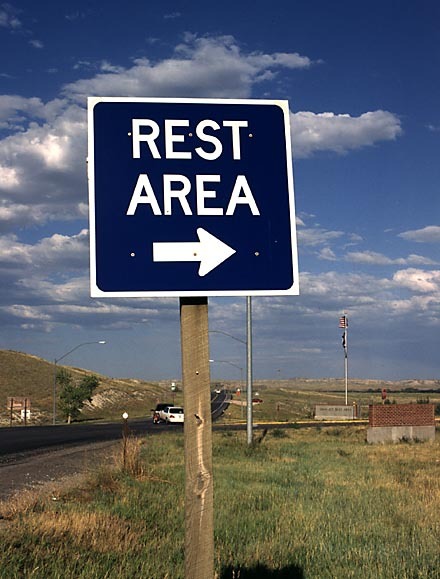 A rest area is located along eastbound U.S. 18 and U.S. 20 near Orin; the rest area also serves Interstate 25 traffic. Photo taken by Jonathan Winkler, 08/00. 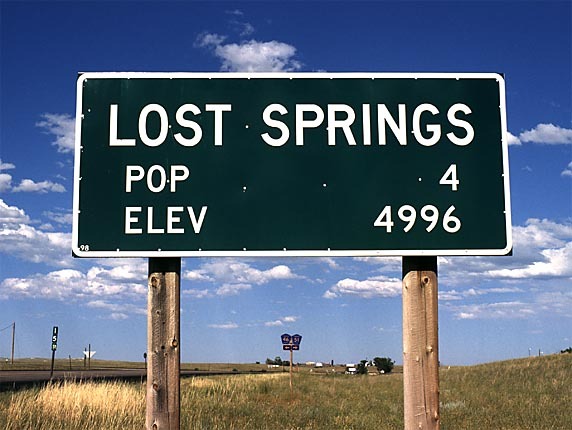 The town of Lost Springs, which is located along eastbound U.S. 18 and U.S. 20 between Shawnee and Keeline, is one of the smallest settlements in Wyoming, a state with plenty of small towns. Photo taken by Jonathan Winkler, 08/00. 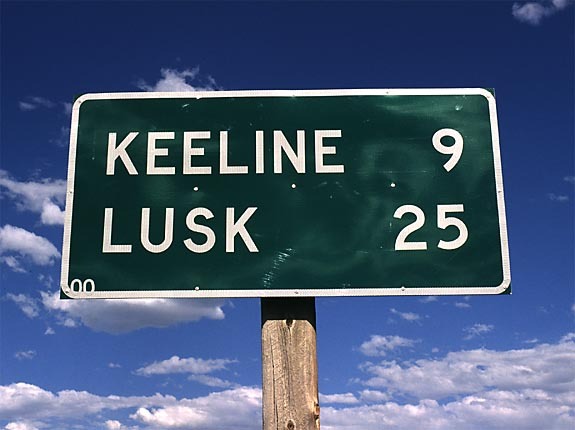 This mileage sign along eastbound U.S. 18 and U.S. 20 provides the distance to Keeline and Lusk. Photos taken by Jonathan Winkler, 8/00. 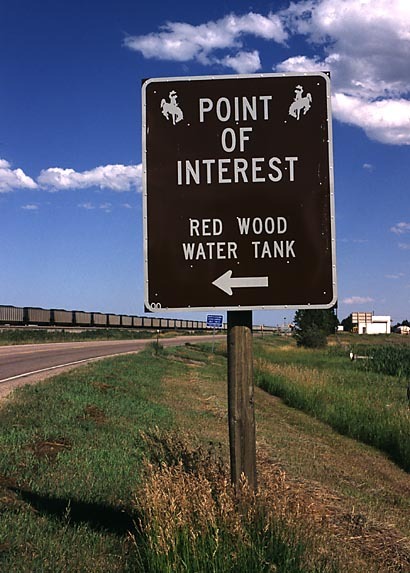 Following eastbound U.S. 18 and U.S. 20, the marker for Red Wood Watertank is located near Lusk. According to the Niobrara County Library, "The redwood water tank was built to furnish water for the steam engines of the Fremont Elkhorn and Missouri Valley Railroad. It came to Lusk July 13, 1886. It was a part of the North Western Line and later became the Chicago North Western Railroad. Water was furnished from a well by a windmill. The original site was several hundred feet west of the present location. Water came from a hand dug well and steam power. Later another well was drilled and the old one was abandoned. The tank is one of six left standing in the United States." (Citation is from "Niobrara Historical Brevity" published by the Niobrara Historical Society, in observance of the Lusk Centennial 1886-1986.) Photo taken by Jonathan Winkler, 8/00. 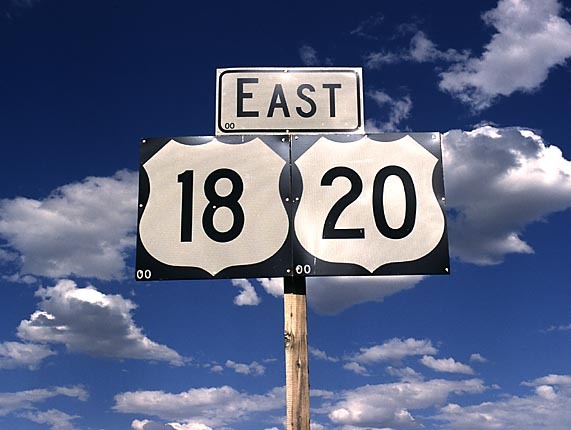 These U.S. 18 and U.S. 20 east shields are found just west of Lusk as the braided route approaches the town. 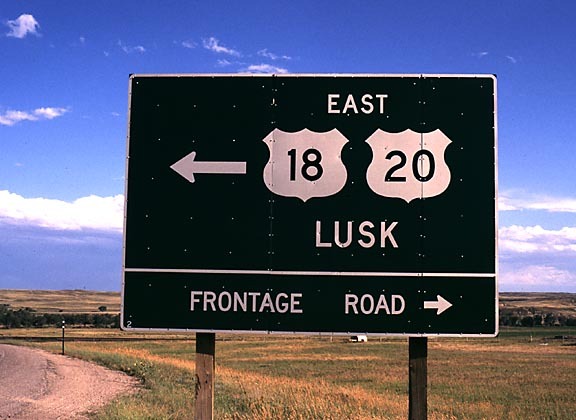 Lusk is the "Crossroads of the West." In addition to the U.S. highways (18, 20, 85), the Union Pacific Railroad passes through town. Both the Cheyenne and Black Hills Trail and Texas Trail ran through Lusk, and historical markers are posted along the routes of these trails. 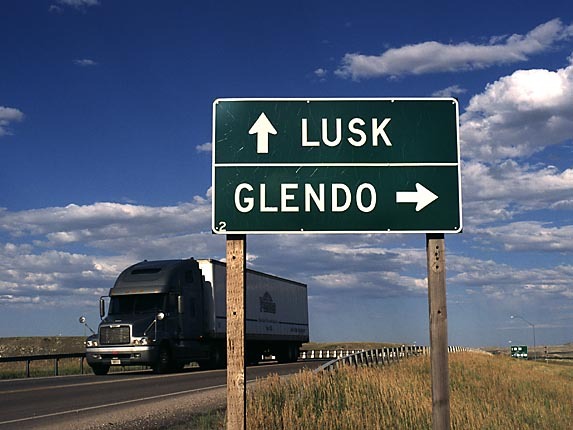 Recently (late 1990s/early 2000s), Lusk was the feature of news stories touting that the entire town is wired for the Internet. Photos taken by Jonathan Winkler, 8/00. U.S. 18 and U.S. 20 (West 8th Street) eastbound reaches its junction with U.S. 85 (Cedar Street) in Lusk. The three U.S. routes turn north onto Cedar Street toward downtown Lusk. 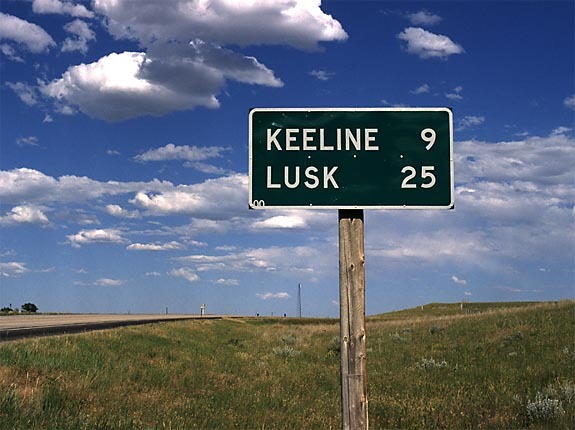 In addition to its status as a gateway to several regional attractions such as the Black Hills, Lusk is also home to the Wyoming Women"s Center, which functions as the state correctional facility for women. The main state correctional facility is located in Rawlins in Carbon County. Photo taken by Jonathan Winkler, 8/00. 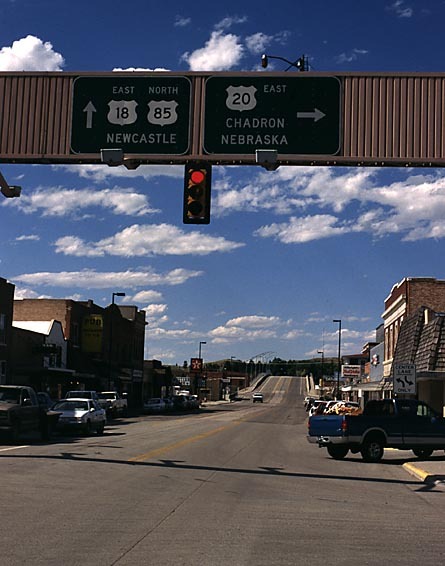 U.S. 20 splits off from U.S. 18-85 and heads east into Nebraska via Third Street; U.S. 18-85 north continue along Cedar Street over the railroad viaduct toward Edgemont, South Dakota, and Newcastle. Note the change in the shapes of the U.S. route shields. Photo taken by Jonathan Winkler, 8/00 and Dale Sanderson, 04/04. 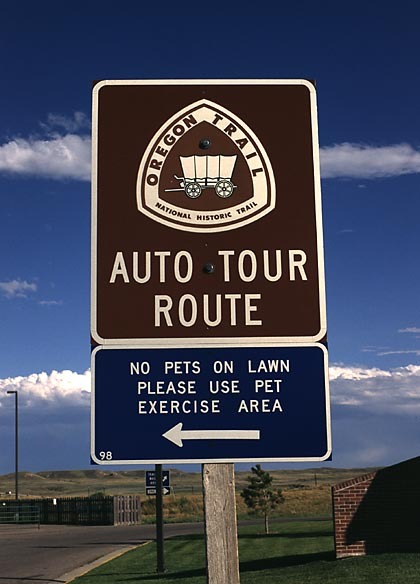 This U.S. 18 and U.S. 20 Oregon Trail Marker is located at the Orin Junction Rest Area. The marker was meant for the Interstate 25 traffic, since the Oregon Trail parallels Interstate 25 and U.S. 26-87 through Orin. Photo taken by Jonathan Winkler, 8/00. This sign is found in the parking lot of Lusk Rest Area along U.S. 18. Photo taken by Jonathan Winkler, 8/00. Here's the viaduct that takes 18/20/85 traffic over the railroad (which runs just off the left edge of the photo). Before that was built, the highway met the railroad at-grade, and I observed a lot of coal train traffic. You can see how, instead of taking down the old bridge over the Niobrara River (the little trickle visible in the foreground), they left it in place to support the new viaduct. The deck is no longer accessible to vehicles, but pedestrians can get there, and the center striping on it is still visible. Photo taken by Dale Sanderson, 04/04. Page Updated October 12, 2005.